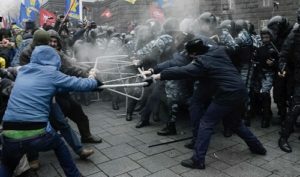 WASHINGTON — The Ukrainian demonstrations have picked up steam again, and this time it was much more violent as protesters squared off against police forces. BBC reported that the Ukrainian government set up new laws restricting public protests, which have hurt the image of the current government led by President Viktor Yanukovich. The parliament passed the law by loyal Yanukovich supporters, after which the opposition called it a coup attempt. The law was a response to massive demonstrations that called for Yanukovich to reverse his decision to back Ukraine out of a trade pact with the European Union. Some of the demonstrations involved toppling a statue of Lenin and smashing it with sledgehammers and marches to protest the brutal beating of a journalist critical of Yanukovich. Now the demonstrations have called for his removal from power. The protesters tried to reach parliament, but were stopped by barricades set up by police, as well as stun grenades and flares. Yanukovich told opposition lawmakers that he is ready to talk to the opposition and protesters.